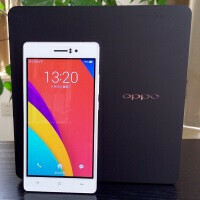 The 0.19-in (4.85mm) thin Oppo R5 was the thinnest smartphone in the world for a week. Almost immediately after its announcement, the 0.18in (4.75mm) Vivo X5 stole the crown with a literal hair's lead. It's plenty ridiculous, but in reality, there aren't that many ways to compete when everyone's using the same chips, same screens, and same core operating system. Anyway, Chinese website CNBeta benchmarked the Oppo R5 and came out with some decent, yet completely unexceptional results. In AnTuTu, the Snapdragon 615-powered device with 2GB of RAM racked up 26,593 points, which is roughly half of what the Snapdragon 805-equipped Nexus 6 (49,480 points) can output. Of course, the Snapdragon 615 processor isn't designed as a heavyweight chip, but rather as a capable 64-bit mid-ranger, and we think it performed according to expectations. We can also see that the 1080p AMOLED display is limited to three-finger multi-touch, but compensates with a "fairly accurate color reproduction". Although performance isn't its strongest point, the Oppo R5 looks incredibly svelte and is a well-rounded package as a whole. With a high-resolution display, 13MP main camera and a 2000mAh battery, this is a pleasantly conventional, minimalist offering from Oppo who, as a company, is mostly about rotating cameras, back panel touch controls, and other experimental features. And the HOUSE button is yuck too. Sony Z1? Is that you? "Although performance isn't its strongest point, the Oppo R5 looks incredibly svelte and is a well-rounded package as a whole. With a high-resolution display, 13MP main camera and a 2000mAh battery" Well them CNBeta guys better get cracking to batt life tests as well as I'd to know how will a 2000mAh batt stand up to SD615 driving an FHD screen. Can't wait to see more devices shipping with the 615, paving the way for more capable mini flagships.